If you enjoy a beautiful secluded white sand beach that you can walk for miles, then Casa Danza welcomes you. Step off the back patio to swimming, kayaking, shelling, and surfcasting in what the locals call “Rooster Fish Alley”. Casa Danza has excellent guest reviews and a 5-star rating. 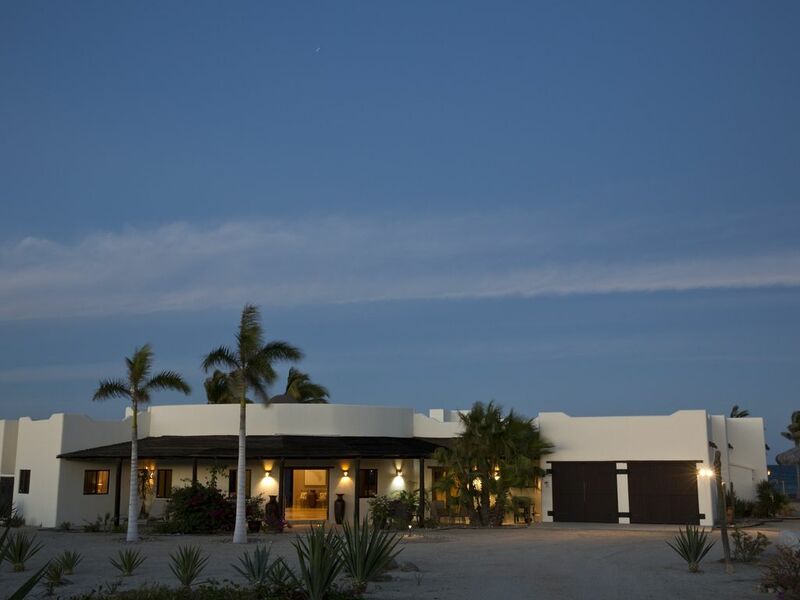 Casa Danza is located on the East Cape five minutes from the unspoiled Mexican town of La Ribera and 50 minutes northeast from the San Jose Airport (the same airport that services Cabo San Lucas). The East Cape, a truly unique place on our planet, has miles of pristine beaches and stunning mountain ranges. The Sea of Cortez is one of the most intriguing and richest bodies of water in the world supporting abundant sea life. At Casa Danza you can watch the annual birthing migration of Blue, Humpback and Sperm whales, see the flying Manta Rays soaring nine feet into the air, or discover turtle nests where the female laid her eggs during the night. Casa Danza is only yards away from a very swimmable and safe white sand beach. Let your heart find its home beside the sea and enjoy the numerous beach amenities provided at Casa Danza; two ocean kayaks, body boards, beach chairs, beach umbrellas, assortment of floaties, and beach towels. The dunes adjacent to the Sea are a stunning example of nature’s artistry. Lots to explore here…Doves, nesting turtles, Road Runners, Quail, Ospreys, sea shells, and lots of other little critters that will greet you on your journey. Casa Danza is a beautiful and spacious 4000 square foot Oceanfront Villa that offers a private tranquil setting for your holiday. Featuring a circular great room, modern fully equipped kitchen, a spacious dining room with a large table that seats eight, three large bedrooms (king master and queen guest rooms), huge marble showers, and a studio that is ideal as a quite oasis for both children and adults. For those days when you need to take care of some business, Casa Danza has a fully equipped office with “wifi” internet, printer, and toll free telephone calls to the US. The design of the great room with views of the sea and mountains creates a unique peaceful and relaxing environment. The great room has two separate seating areas; the entertainment area provides for easy conversation and includes a sound system and DVD player, and the second area is more intimate setting for games, puzzles, or reading. There are beautiful views of the Sea of Cortez from almost every room. As most of the daylight hours are spent outside, Casa Danza’s two large patios provide the ideal locations to enjoy the magic of the Baja. The front covered patio is the perfect place for breakfast, a quite space to enjoy your coffee and watch the Baja wakeup while listening to the birds singing. The spacious ocean facing back covered patio is the heart of Casa Danza during the day. Just a few steps from the beach, you can watch for whales, marvel at the antics of the Pelicans, eat lunch, read a book, enjoy an easy relaxed conversation, sip an afternoon margarita, or just catch a nap on the chase lounges. Casa Danza is the perfect spot to get-away, unplug, unwind, and enjoy a laid-back Mexican vacation. Blue water fishing is world-renowned in the Sea of Cortez. Marlin, Sailfish, Wahoo, Tuna, Roosterfish, and Dorado hold the allure of being larger than life and potential world records are always a possibility. Have Captain Trino pick you up in his 25 foot center console fishing boat directly in front of Casa Danza for a reasonably priced day of blue water fishing. There are also a number of options for larger boat charters from local hotels. Surfcasting is literally just a step away. Enjoy the early mornings and evenings surfcasting the beach for Rooster Fish, Lady Fish, Pompano, Sierra, Jack Crevalle, and an occasional Dorado. Casa Danza is located in one of prime locations for site fishing to large Roosterfish during the summer months. Fisherman come from all parts of the US to test their surfcasting skills and entice a large Roosterfish strike their fly or lure. Fly-fishing guides are available including all the equipment. If the fish are not biting, enjoy the Gulls, Pelicans, and Ospreys diving for baitfish. This relaxed authentic environment of the East Cape provides a “real experience” of unspoiled Mexico. The neighboring towns of La Ribera, Santiago, and Los Barriles offer a number of restaurants and shops, friendly helpful people, and most importantly a very safe environment. Yet, for a taste of the big city life San Jose, Cabo and La Paz are an easy drive from Casa Danza. San Jose (50 minutes) and Cabo (90 minutes) have dolphin pools, golf, restaurants, large hotels, night clubs, extensive shopping and sightseeing. La Paz (120 minutes), the capital city of Baja California Sur, has even more shopping, restaurants, and a beautiful harbor with an extensive harbor walkway. As the harbor is a sanctuary to many species of fish including Whale Sharks, La Paz also offers numerous whale watching, kayak, swimming with the Whale Sharks, and diving excursions that are unique. Abel, the Casa Danza Manger, will greet you in the first day or two of your stay and will assist you with the locale, cultural events, scenic areas, or any other questions. Extra housekeeping services or in home cooking can be arranged in advance. Casa Danza...where the heart finds its home beside the sea. We look forward to sharing the experience with you. We had been vacationing in the Baja since 1990 in the Cabo to San Jose del Cabo area as it was just three hours from their home in Boulder, Colorado. On our first visit to the East Cape we knew we were home; a relaxed truly Mexican lifestyle, wonderful uncrowded beaches that you could walk for miles, and Roosterfish chasing bait just off the beach, an ideal spot to unplug and relax. We have a son and daughter, both of whom are married, and two grandsons and two granddaughters. Over the years our entire family including children and grand children have enjoyed visits and celebrations at Casa Danza and characterize it as a special place on the planet. Casa Danza offers something for all the members of our family from wind sailing to bicycle riding, great deep sea fishing to chasing Roosterfish with fly rods from the beach, swimming with whales sharks to just walking the beach. We were attracted to the East Cape because of its rural lay back lifestyle and looked at a number of properties before buying the one acre beachfront lot and building our home Casa Danza. The decision to buy at our location was based upon a number of factors; the beautiful safe sandy beach the went for miles, the spacious lots in the Playa Colorada development, and of course the school of Roosterfish chasing sardines on our first visit helped make the decision easier. The location being within 5 minutes proximity of the charming Mexican town of La Ribera was also a key factor. La Ribera is an authentic small Mexican town, the people are very friendly, and offers a few good restaurants and grocery stores. A great place to slowdown and enjoy life. Our decision has been reinforced over the years every time we visit...watching the humpback whales spout and jump, catching a striped marlin on a fly rod, watching our grandchildren enjoy the warm Sea of Cortez water, ocean kayaking, exploring the country side on quads. Beautiful sunsets and sun rises are a daily occurrences, star gazing is amazing, a full moon will paint a white path across the Sea of Cortez. The Sea of Cortez, due to its deep trenches and constant sunlight, is one of the most prolific fish hatcheries in the world. Whether its chasing Roosterfish down the beach or catching a nice Dorado in the blue water the fishing is terrific. Swimming with 20 foot whale sharks in La Paz harbor, which is a breeding ground for these gentile giants, is a once in a lifetime experience. Cabo Pulmo National Marine Park, home to the oldest of only three coral reefs on the west coast of North America, is only a short 20 minute ride from Casa Danza. Snorkel the coral reefs or go diving and swim with the Sea Lions. Walk a pristine white sand beach for miles and see only a handful of people. Casa Danza where the heart finds its home beside the sea. The beachside patio enjoys views of whales, rays, Roosterfish, pelicans, osprey. The sunsets and sun rises are spectacular, star gazing in the pollution free sky is a amazing, and a full moon...wow! All kinds of beach toys...boogie boards, floats, life vests, pals & shovels, balls, beach umbrellas, etc. Two large patio areas with sun portals, chairs, tables, and lounges. The front patio provides a a view of the mountains. The back deck is on the Sea of Cortez. Greatroom with two seprate sitting areas, private master suite with large bath and office, seperate two bedroom guest suite with bath and studio. Shaded patios with ocean and mountain views. We arrived at the house after dark and when we drove up landscaping and house were beautifully lit. When we unlocked the door everyone said wow! This was a family trip with six adults and two grandchildren 6 and 11. We walked into a huge great room with a number of sitting areas and the view of the ocean from the house is absolutely beautiful. Furnishings are first class and very lovely. The kitchen was modern with lots of counter space and very well-equipped lacking nothing. Lovely bedrooms with huge showers and all of them had ocean views exceptions the twin bedroom which viewed the desert. Large patios both front and facing the ocean with a very nice barbecue which we used several times. Unfortunately, the eight days of our stay had an unusual cold spell with a lot of wind. The first day we were there was sunny and not too windy so we were able to use the kayaks and swim. The kids had lots of fun playing in the sand with all the toys that are available. There were plenty of lounge chairs and fold-up chairs for everyone. John and Lynn we're very accommodating and bent over backwards to make our stay enjoyable. Our family loved Casa Danza and hope to return. What an incredible week we had at Casa Danza. Prior to the trip, Lynn and John were extremely accommodating in regards to informative emails and updates on the property, travel from the airport and things to do in the area. All were very helpful. As far as Casa Danza, the photos really do not do justice to this incredible home. Spacious, modern, and everything we needed or could have wanted. We spent many hours on the back patio just enjoying the beauty of the Sea of Cortez, whale watching, and enjoying the flying sea rays. Very, very peaceful and quiet. The recommendations that were provided in the packet were very helpful and I would highly recommend taking a close look as far as places to go, eat, sight-see, etc. We took Lynn and John's advice and went out with Trino for a great day of guided fishing. I know this is a slow time of year, but we caught Bonita, skipjack, amberjack, and rooster fish. The highlight was hooking and playing a 10 foot mako shark for 15 minutes before he broke off. He jumped five times and we were guessing each jump was at least 10 feet high. Wow! We took home a batch of Bonita filets and sent Trino home with a bunch more. That night we enjoyed a fantastic in-home dinner with Maira - traditional Mexican food that was fantastic as well as some of the fresh bonita. One day the ocean laid down so the boys took the kayaks out a couple of miles on a flat sea and caught over 20 Bonita and skipjack. They released them all and it was the highlight of the trip for both. Thank you so much again for letting us stay in your wonderful home. We all agreed that it was ‘the best trip ever’. Can't wait to return. We appreciate that you selected Casa Danza for your holiday and enjoyed Casa Danza and the East Cape. Your review is one of the most unique reviews we have received...fully of action and adventure. Casa Danza lends itself to a family similar to yours so positive and enjoying all our area has to offer. Likewise, for families that want to kick back and relax, Casa Danza is the perfect spot. We welcome your return and thank you for your kind words. Casa Danza ...where the heart finds its home by the sea. Beautiful home. Beautiful beach. The owner Lynn Stasz was very helpful in our planning. Beautiful home. Well built and maintained plenty of beach chairs, toys, etc. the surrounding area away from the beach isn’t quite as beautiful as Cabo pulmo(which is much more remote) or Los Barielles but both are easily accessible from the house. We love being away from the crowds. We found a couple nice little restaurants in La Ribera but there isn’t much more there. We had Lupe cook 3 dinners in home for us (at the recommendation of the owner) and she is an incredible cook and fun to talk to as well as being very affordable. We thank Scott H. for choosing Casa Danza for his Post- Christmas Holiday. Regrettably, the weather was not the most cooperative. Thus, Casa Danza would welcome Scott and his family to return when better weather prevails, and one can truly enjoy Casa Danza’s close proximity to the beach and its full array of beach toys. Casa Danza is pleased to offer Lupe, a local chef, for in-home meals. It is an enjoyable and truly tasty, fun, cultural experience. If you are looking for a private / off the beaten path holiday where you want to check-out for a bit and enjoy a postcard worth beach practically to yourself, Casa Danza should be your next destination spot. This oceanfront home is stunning. It is a dream vacation spot for your family and/or group of friends. Casa Danza is an oceanfront home that is comfortable and has a great layout for lounging around or entertaining. Lynn & John were amazing hosts! They were always available to answer our many questions. They sent information on the home and area so that we could become familiar before our arrival. They checked in with us throughout our stay to make sure that we were comfortable and having a great time. They genuinely care about each of their guests and ensure that they enjoy their stay at Casa Danza. Thank you, Lynn & John! You, both, are very welcome and thank you so much for your kind words. It was our great pleasure to host you and your Guests at Casa Danza. Thank you for allowing us to share in and to be part of your very successful event. We look forward to your return and welcome you to enjoy Casa Danza and the East Cape in the future. We were looking for a nice home on the beach with privacy. We got that and more with our stay! The owners were extremely accommodating. They are American, and it was comforting to speak with them when booking a home in a foreign country. Additionally, they were incredibly accommodating and helpful before our stay with recommendations on personal chefs, guides for fishing, places to visit, where to get groceries, contacts of car rental representative, and more. Because of there notes and helpful tips our trip was exponentially better. They have stocked the house with nice sheets, lovely towels, and all the outdoor equipment you would want to play on the beach. We loved this little getaway and felt lucky to have found such wonderful people to rent from for our trip. If you are looking for a quiet vacation with little tourism...this is for you! We found exactly what we were looking for and more. Most days we were the only ones on the beach. We will be back for sure! Thank you, Nicole, for your kind words and superb review. We so appreciated receiving the photos showing your lovely family. We commend your well executed surprise for the youngsters which resulted in their unique trip to the East Cape and Casa Danza including beach time, fishing, and total relaxation. It is such a thrill for devoted fishermen like your husband to land a deep-sea Marlin and your son to land a trigger fish in front of Casa Danza. We invite your entire family to return and try fishing for Rooster Fish from the Casa Danza beach. Your holiday enjoyment is our primary goal and we are delighted to learn that this unique surprise get-away not only allowed your family to re-connect but also to enjoy new adventures on the Sea of Cortez. We would welcome your return visit in the future. Warm regards, John and Lynn Stasz Casa Danza…. where the heart finds its home beside the sea. I can not imagine a more perfect place if you are looking to get away from the madding crowd and find some relaxation on the beach. The house is just beautiful and the kids had so much fun chasing each other all around the vast great room. The shady patio is literally just a couple of steps to the beach which has the softest white sand and shallow access to the water. We hardly saw a soul all week on the beach despite the fact it was Semana Santa. The owners John and Lynn helped us with all of our planning and could not have been more gracious. Lupe, their recommended caterer, prepared two fantastic meals for us and we were able to stock up on supplies near the airport upon arrival and replenish at the local grocery stores (fairly limited selection in la Ribera). We found a couple of great restaurants, I got to windsurf in nearby los Barriles, we went out Rooster fishing with Captain Trino, snorkeling on the coral reef including playing with the dolphins and sealions at Cabo Pulmo.....and lots of relaxing! We are already planning our next trip.. Thank you, Julian, for the exceptional review. We so appreciated receiving your updates and photos showing your lovely family…. all smiles. We believe that when Casa Danza’s guests smile…Casa Danza smiles in total delight that you all are enjoying a wonderful holiday. It is our objective to provide a special place…that is a unique get-away…where a family can “unplug and unwind” and enjoy new adventures on the Sea of Cortez. We are so happy you felt it was just that. We would welcome your return visit in the future. Casa Danza…. where the heart finds its home beside the sea. Cancellation Policy: Reservations canceled more than 60 days prior to arrival are fully refunded less a $400.00 cancellation fee. Reservations canceled less than 60 days of arrival date are 50% refundable. If space is re-sold following cancellation, full refund will be made, less cancellation fee.